Jennifer Singh defies expectations. Growing up in Fresno before the establishment of Title IX law, Jennifer’s options in athletics in high school were slim. She competed for a time in her 20's and 30’s as a weightlifter. It wasn’t until her 50’s that she picked up running. Which she describes has mainly been for stress relief purposes. However “picked up” would be an understatement. What Jennifer did was take the ball and run with it. Without any coaching whatsoever, she qualified for Boston on her first try—which she attempts to modestly downplay. 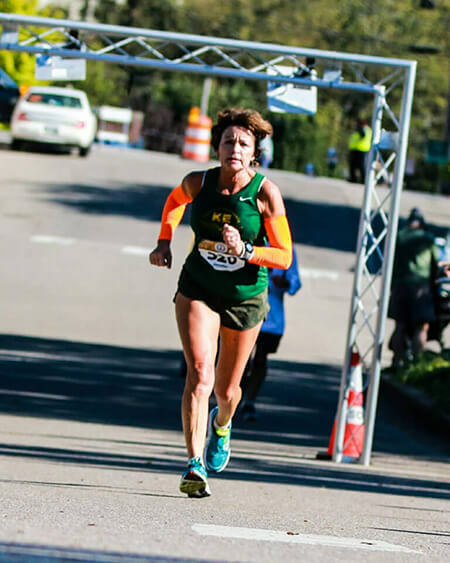 Running the Knoxville Marathon in 2012, Jennifer qualified by over 15 minutes at 3:44. Just to give you a full extent of the enormity of this accomplishment, the author of this article could barely clock a 3:51 marathon at age 30 on his first try. Jennifer beat that time by 7 minutes when she was 53. 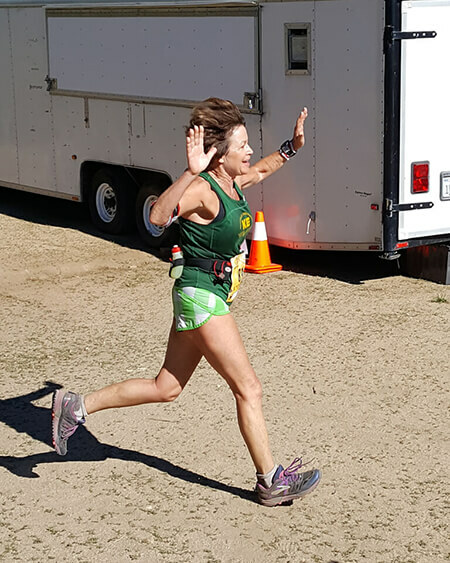 Jennifer did follow a training program loosely that was published in Runner’s World, as well as attending local KTC long runs on the weekends. Perhaps it was the consistency of those training efforts that gave her that extra boost, but more than likely Jennifer is just really, really tough. Jennifer supplements her training by lifting at least 3 times a week. Something she asserts plays a factor in being able to finish so well. She also gives credit to her diet, which she says is similar to the diet she ate while lifting weights. You can’t argue with the results either. Jennifer’s first year at Boston was 2013, which she doesn’t describe lightly. A year that does not need details in order to glean the tragedy that occurred. She summed it up in three breathless words. She ran a decent race and finished ahead of the blast by a window of 20 minutes, but unfortunately, no race time can eclipse the loss that occurred that day. As many athletes felt afterward, she ultimately was determined not to let fear drive her decisions moving forward. She returned again in 2014, and in 2016. In speaking with Jennifer a trend begins to emerge. This is a person that rises not just above a challenge, but above the curveballs and the storms that life inevitably sends. It’s arguable that the strength of her character is reflected in the strength of her running. Likely not standing an inch over 5’4” Jennifer Singh may be stronger than most people you will come across, and if there is anyone I’d bet will be smiling at the finish line this April, it’s her.